Using white face painting stick, draw fangs from each corner of your mouth. Then with a red face painting stick, add some drips of blood from each fang, carefully paint the lips, and add a line at the outer corner of each eye. Using a black face painting stick, draw exaggerated eyebrows and draw and upturned triangle at the hairline. Carefully outline each dracula fang. 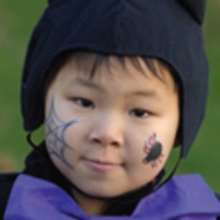 Again using a black face painting stick, draw bat shapes on the forehead and cheeks. You are a scary Halloween Dracula vampire!